How will Mark Richt rationalize this loss? Was Georgia Tech and their triple-option offense the better team? 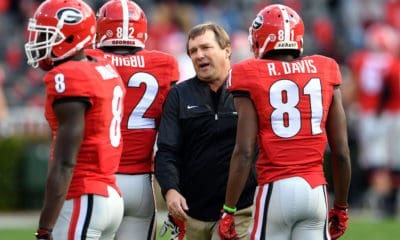 Was Georgia’s defense to blame? Or was it the Bulldogs’ special teams again? 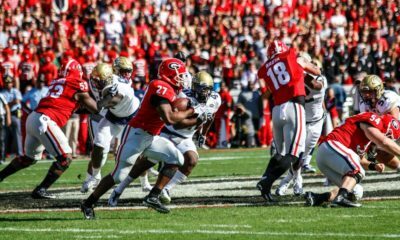 Either way, the Yellow Jackets ended their 7-game losing streak against UGA by rushing for 409 yards and beating the Bulldogs between the hedges 45-42. Going into halftime, everything was going Georgia’s way. The Dawgs were cruising behind Matthew Stafford and senior wide receiver Mohamed Massaquoi with a 28-12 advantage. But then came the 3rd quarter. The Bulldogs inexplicably kicked the opening kickoff out of bounds, giving the Yellow Jackets the ball at their own 40-yard line. This was the 2nd Georgia kickoff of the game to land out of bounds. On Tech’s first play, Jonathan Dwyer rushed for 60 yards and a touchdown. The Yellow Jackets scored on their 2-point conversion to cut Georgia’s lead to 28-20. Georgia then gave the ball back after a 3-and-out. On Tech’s next possession, they scored on a 10-play drive, converted the 2-pointer and the game was tied. On the ensuing kickoff, Georgia’s Richard Samuel fumbled, giving the Yellow Jackets the ball at the Bulldog’s 23 yard line. On the first play, Jonathan Dwyer rushed 23-yards for the touchdown, giving the Yellow Jackets the lead for good. 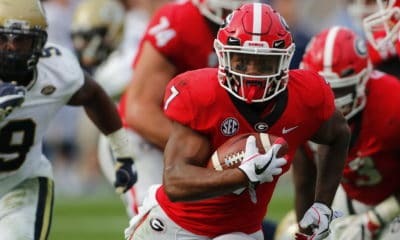 Georgia’s 3rd loss of the season overshadowed great performances by senior wide receiver Mohamed Massaquoi and junior quarterback Matthew Stafford. Massaquoi caught 11 passes for 180 yards and 3 touchdowns. Stafford, possibly playing in his last game at home, completed 24-of-39 passes for 407 yards and 5 touchdowns. In the 1st quarter, Stafford threw an interception that was returned 35 yards for a touchdown by Tech’s Morgan Burnett. The loss completes Georgia’s 2008 regular season, giving them an overall record of 9-3. In their 3 losses, the Bulldog defense surrendered an average of 45 points per game. Not exactly what you would expect from a Georgia team that was ranked 1st in the pre-season. 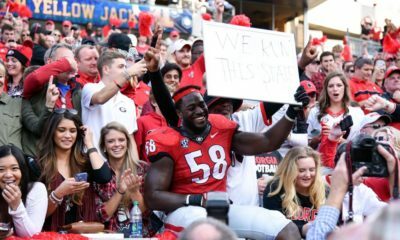 Barring some unexpected results in other games, the Georgia Bulldogs should receive an invitation to the Capital One Bowl in Orlando. If invited, they will likely face the Ohio State Buckeyes. The game will be played on Thursday, January 1, 2009 at 1:00 p.m. ET.